The boyhood home of the groom, William Gelder Shepardson. Pair of scissors, father of the bride. Two brooms, mother of the bride. Set of napkins, Allie Bosomworth. [Alice, sister of the bride]. Set of plates, Irene Bosomworth. [Sister of the bride]. Glass water pitcher, T. Shearburn. [Likely groom’s sister’s husband’s brother, Thomas A. Shearburn]. Set of goblets, Mrs. T. Shearburn. [Wife of groom’s sister’s husband’s brother]. Pair of vases, Mary Bosomworth. 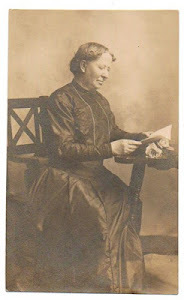 [Likely cousin of bride, Mary Jane Bosomworth, daughter of George Robert Bosomworth, and born same year as the bride]. Pair of towels and coffee mill, Mr. and Mrs. N¬__. Set of knives and forks, John Allen. Lamp, Mr. and Mrs. T. Towse. Set of napkins, Mr. and Mrs. S. L. Berryman. Set of goblets, Enola Peebles. The set, John Candler and Ida Towse. [John Candler was the likely the brother of the bride’s aunt, Sarah Candler Bosomworth]. Comb case, Annie Bosomworth. [Anna Belle Bosomworth, sister of the bride, and my great grandmother]. Lamp, John and Lucy Forth. Pair of salt stands, Mr. and Mrs. H. L. De__. Butter dish and water pitcher, H. Stamm. Box of matches, Jessie Bosomworth. [Sister of the bride]. Syrup pitcher, W. D. Forbes. Tin cup, Edgar N__. Pair of towels, Mr. and Mrs. Birdsall. Glass watcher pitcher, Jas. Candler [James Candler was the likely the brother of the bride’s aunt, Sarah Candler Bosomworth]. Two pickle dishes, Carrie Ulster. Silver butter knife, Eliza ___ckels. Table linens and towels, Dr. Collins, pref. _____, Fred and Frank Towse. I suppose it would be natural considering all of the above, to wonder if the title of the piece is ironic. After all, the wedding was in the home of the local blacksmith, and the bride’s parents give the couple a pair of scissors and two brooms. What struck me as I did a bit more research, is that the groom’s adopted family does not seem to be represented well among the givers of gifts. Thomas Gelder seems to have been a well-to-do and prominent citizen of the county, and was still living at the time of the marriage. It is not clear if William Gelder Shepardson benefitted financially in any way due to his connection with his adopted father. William went on to make a business out of digging wells. I have yet to find any further information on his biological father, George Shepardson, or his mother. The only thing I know about them is that George was from England, and William’s mother was Irish. William and Mollie had at least five children: Piercy Dickenson (named for Mollie’s uncle), Mary Louise, Charles Bosomworth (named for Mollie’s father), Edith, and Nellie Gladys. Mollie died in 1943, and William died in 1946. I would be interested if any of my gentle readers can identify any of the other guests, and their relationship to the family if known. The Towse family figures into the Joseph Marlow story later, as he rents a Towse family farm.